Could it be? 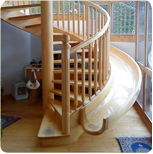 A spiral slide?!! Wheeeeeee!!!!! If I ever get to design my dream house I insist on having one of these! Spied via Ohdeedoh.